The people of tropical Asia have reaped the rewards of their botanical heritage for centuries. The Spa is a magnificent two storey building offering a wide range of health and beauty treatments using natural fruit and flower extracts that will totally indulge you from top to toe. It offers wonderful relief from the tiring flight and is a great way to re-energize, refresh and rejuvenate the senses. Design interior of The Spa reflects the influence of traditional Balinese style, culture and comfort. While this spa beautifully designed with indoor and sea breeze treatment rooms. Offering that all – Asian prison of showering naked next to nature and guest can be pampered in the privacy of their own residence too. Specially assigned the spa staff are dedicated to your every need and expertly to treat you. Our objective is to pamper you with our expertise and trained, leave you with beautiful skin, a purified body, invigorated soul and soothed mind. The Spa At Puri Santrian is a place where you can experience “ East meets West “ treatments. From Balinese body massage to nail care, from face to body treatments, Royal Javanese body scrub known as “ lulur “. Fresh Papaya Enzyme, Avocado and Cucumber fruits scrub, detoxifying seaweed and volcanic mud body mask all using natural Indonesian finest ingredients as well as Phytomer an exclusive European marine-elements base products. Offering that all Asian prison of showering naked next to nature and guest can be pampered in the privacy of their own residence too. Specially assigned the spa staff are dedicated to your every need and expertly to treat you. Our objective is to pamper you with our expertise and trained, leave you with beautiful skin, a purified body, invigorated soul and soothed mind. A visit to The Spa at Puri Santrian a beach resort will reward youth good health regained youth and uplifted spirits. The Spa At Puri Santrian is a place where you can experience East meets West treatments. From Balinese body massage to nail care, from face to body treatments, Royal Javanese body scrub known as lulur . The Spa at Puri Santrian is a peaceful place to relax and a homey ambience created to fulfill all guests need. Our friendly staffs are always expecting your visits. Handed down through generations for healing and strengthening the body and mind Traditional Balinese Massage, Aromatherapy massage, Foot Reflexology and Healing Massage. Manicure and Pedicure, hands and feet care completed with nail shaping, cuticle cleaning, skin scrub, gentle massage on hands and feet, exotic nail polish. 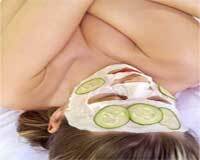 PHYTOMER facial, An exclusive European product the world of specialist in cosmetic treatments base on marine active agents. A beauty treatments adapted to your personality, giving your skin the essential of the sea. TROPICAL REFRESH the Asian beauty recipes refresh your skin. Begins with a cleansing step, face massage and face mask designed for oily, dry, normal and sensitive skin. LULUR a Javanese royal heritage made from finest herbal ingredients. FRUITY Papaya enzyme, Avocado and Cucumber promote soft and silky glowing skin for days. PHYTOMER born from the depth of the sea offers Detoxifying and Firming body mask. TRADITIONAL Body Mask, Seaweed and Volcanic mud providing a glowing and healthy skin. Pamper yourself and soak in a warm tub filled up with fresh roses and in the meantime inhaling the exotic aroma of Frangipani essential oil. Indulge your holiday pleasure with this genuine ? Heart of Bali ? spa treatment. Allow your self to slip into a reviving head to toe signature spa sampler, featuring traditional Indonesian essential oil. Includes : Sea salt foot bath, Aromatherapy massage, Lulur body scrub & yogurt splash, Flower bath, Traditional facial, Traditional manicure & pedicure, ginger drinks, Free 1 spa gift. Complete your memorable ?island of the Gods? experience with healthy glowing skin. The pursuit of beauty indulge withnatural herbal products is a Balinese tradition. Includes : Sea salt foot bath, Aromatherapy massage, Lulur body scrub & yogurt splash, Flower bath, Tropical refresh facial, Mineral water or herbal & ginger drinks. Revitalize and restore with the removal of impurities from your body with detoxification techniques. Includes : Sea salt foot bath, Balinese traditional or aromatherapy massage, Lulur exfoliating or papaya enzyme body scrub, Seaweed or volcanic mud body mask, Mineral water, herbal & ginger drinks. Get back your wellness bliss with detoxifying treatment using natural seaweed and aromatherapy products. Includes : Sea salt foot bath, Balinese massage, Exfoliating body scrub, Detoxifying body mask, Phytomer facial., Mineral water or herbal & ginger drinks. Relax as your body is enveloped in a cool gel concentrated with marine nutrients and spring-water micro-capsules. This refreshing and a total revitalizing treatment leaves the skin moisturized, toned and helps promote the formation of elastin and collagen. It is highly recommended after sun-bathing. Experience the healing tradition of our eastern body Spa with the ancient healing. Includes : Sea salt foot bath, Balinese traditional massage, Cucumber or avocado fruit scrub, Flower bath, Mineral water or herbal & ginger drinks. Be a King or a Queen for a day ! Together, find you and your loved one to slip into a luscious head to toe signature Spa sampler, featuring traditional Indonesian essential oils. Includes : Seasalt foot bath, Choices of massage ( Balinese traditional or aromatherapy massage ), Choices of body scrub ( Lulur herbal or papaya enzyme or avocado or cucumber body scrub), Splash yogurt skin conditioning, Flower milk bath, Phytomer facial, Traditional manicure or pedicure, Foot reflexology , ginger drinks, Free 2 spa gifts.